For some young brides the choice of their wedding dress is not a problem, because they have known since “forever” what they want – now all they need to do is find the right model. But what if the choice is not that obvious? Take a look at our guide! Let’s just point out: do not give up on a dress just because it is not recommended for your type of silhouette. Try it. Sometimes a particular model of dress looks better on you than on a hanger. 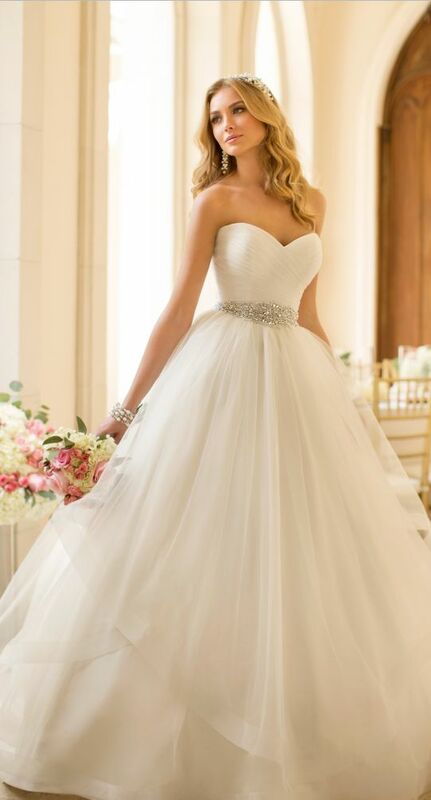 Do not hesitate to consult consultants in wedding dress salons – they really want for you the best and help you choose a dress that will meet your expectations and will be adapted to your silhouette. So what wedding dresses’ models do we have? This is the wedding dress that can be associated with a meringue or wedding cake figurine. For who? For girls who want to hide wide hips, tummy, massive thighs or calves. And also for young brides with a small bust, which is very much exposed in the corset. Who should avoid it? Brides with massive shoulders and bunny buns, and also – filigree girls. This is the most versatile fashion – it looks good on most of silhouettes. When we think of classic wedding dress, we usually have this model on mind. For who? Almost for every silhouette! But it is recommended to choose a boat neck or a V-shape cleavage if you have bigger breast. Another version of this model is the “modified letter A”, a dress with lowered waist. The skirt takes on the volume around the hips. The characteristic feature is the high waist – the dress is cut under the bust, and its bottom is made of a leaking material. This type of dresses can be associated with a “Greek goddess”. For who? For girls who want to cover up the tummy, they are pregnant or they are short: cut off under the breast lengthens the silhouette. This is one of the most beautiful wedding dresses and what is important – covers more of the for the imperfection of the silhouette than the classic siren model. For who? For brides who want to highlight their figure – the bust and the hips but want to keep the balance of the proportions. Often mistaken with a trumpet model. The difference is that the skirt in the case of the siren begins to expand at the knee level, not the thigh. For who is that dress? For brides with a figure of hourglass who want to emphasize their curves. Who should avoid? The brides who want to cover up this and that: trumpet will be a better choice for them. Charming fashion, which beautifully exposes the legs and allows to show the original wedding shoes. For who? For a bride who feels good in this length and want to expose the calves.